MG are avoiding the £10,000 ceiling, after revealing their new MG3 supermini will cost between £8,399 and £9,999. Available in dealerships from September 2013, all four models are powered by a 106PS petrol engine with a five-speed manual gearbox. Each version has a predicted insurance group rating of 4E, less than half the rating of equivalent competitor products. Top of the range is the MG3 3STYLE with 16” ‘Diamond’ alloy wheels and a sports body styling pack that includes: cruise control, automatic lights and windscreen wipers, reverse parking sensors, rear boot spoiler and side sill extensions. 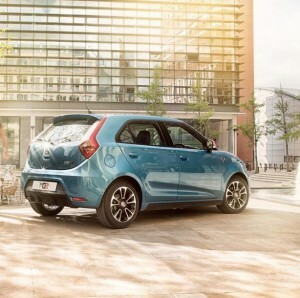 The MG3 3FORM SPORT comes in at £9,549, offering: air conditioning, DAB radio, Bluetooth and audio streaming, leather MG-design steering wheel with red stitching and steering wheel audio controls, sports body styling pack and 16” ‘Carousel’ alloy wheels. Available for £9,299, the mid-range MG3 3FORM has all the SPORT offers without the body pack and alloy wheels. Meanwhile, the entry model MG3 3TIME costs £8,399 and features a CD player with MP3 compatibility and Aux-in facility. All models have MG signature front LED lights, electronic hill hold as standard, six airbags, electronic stability control, corner brake control and traction control, with all but the entry model featuring a high quality DAB audio. Guy Jones, Sales & Marketing Director at MG, said: “The MG3 gives the market something really new; a stylish, highly practical, small car with many options for personalisation that is fun to drive, fun to buy and fun to own. “With all models in the range priced below £10,000 and insurance expected to be just 4E, we can offer this type of product at a price position that no competitor can match. “MG became world famous for building distinctive, British, small, fun cars at a remarkably affordable price that owners then personalised to their own individual style.